How can I reuse or recycle a lot of white yarn? | How can I recycle this? How can I reuse or recycle a lot of white yarn? From my sister in law I inherited a lot of yarn, mostly small balls of the same. I know you covered the item about the short ends of yarn and what to do with it. My question is a bit related. handy choice. Moreover, most of the yarn is synthetic, which I don’t really like to wear and makes it difficult to paint in a different colour. So, my question is: What can I do with that white yarn? It is a box full of yarn (20 by 30 by 20 cm). Looking forward rather than back, I don’t wear white or choose to wear synthetics either but a lot of people do – and spring & summer are the months when a little white shrug or cardigan might be useful – perhaps keep some and pass the rest on to someone else via Freecycle/Freegle or Ravelry’s destash area. Any other suggestions of patterns of things to make with it (ideally not clothes)? Or places to pass it on? 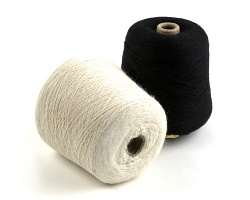 Synthetic yarn generally makes good pot scrubbers, and some of it is good for face cloths as well. If you use it in crafting, it can often be painted. I dunno, it depends on the synthetic whether I’ll wear it, and if it has lots of nylon, you can dye it like wool with food colors. I would use it to make an afghan, several rows of white and a couple rows of variegated colors that included white yarn. I have made a few baby afghans like this and the white rows (maybe 8-10) make the two rows of variegated colors pop. Another thing I would do with them is to crochet round balls and fill the center with a cloth stuffed and tied with catnip or catmint…..cats love these. You could crochet a deep lace edging on bath or hand towels giving them a bit of a fancy/luxurious appearance. Or you could crochet the edge on towels you give away as presents. Or just a narrow lace around face washers. Sure cotton would be nicer, but this should look and feel good too. If the yarn is not too thick you could crochet lace to go around pillowcases. Could be used for crocheting dolls clothes. If you had a small window, or a long narrow window in a door perhaps you could crochet a nice curtain for that window. How about one of those “mile a minute” type afgans where you crochet or knit with 4 or 5 different strands at the same time. You can blend a whole bunch of textures, types and colours together at the same time. The white could help tone down some shocking or painful colour! 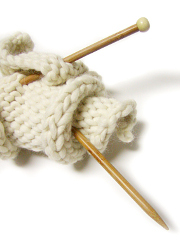 Fold the arms in half so the arms are 15 stiches wide and 16 rows long. Sew round the outside of each one, leaving a place to stuff. Stuff each peice with stuffing or old material, or anything that wont poke through the wool. And since it went so well, I also made a cover for my window cleaning tool with a very long stick. Now I can use it as a ceiling mop. Because of the loops, you need a lot of yarn for it and synthetic is only good for these kind of things. http://feliciafollum.blogspot.com/2011/02/circuits-inspired-art.html – here is an alternative drawing idea…I used string for one of my drawings in this class. you could make a yarn wreath-I have seen pictures of all white yarn for Christmas and they are quite nice. Check out this link.